Image of Jesus Appears on Dining Room Chair Velvet Back! The auction is on eBay, and there is a story with it. But suffice it to say- after weeks of no images of Jesus or The Virgin Mary...we find this auction...and you can own the Jesus Chair....starting bid is $100. eBay Pulls Lavonne Drummond's Baby Naming Auction! The Bid was $15,000! Unemployed Mother Lavonne Drummond Offers Baby Naming Rights To Newborn Boy to Highest eBay Bidder! Bid for Susan Boyle Marbles on eBay.....Boylemaina begins!!! What about a Shower Curtain? I checked eBay and saw many different unauthorized Susan Boyle items....but one especially caught my eye....Susan Boyle Marbles.....this is only the beginning. John Greene Finds Image of Virgin Mary on a Skittle's Candy! Really! Phoenix resident John Greene was eating some "Skittles" candies when he came across a red piece that had an image of the Virgin Mary on it. Greene says that he will be offering the candy piece up for auction on eBay! The folks who sell on ebay won't be happy with this story, nor will the ebay execs. Patrick Munoz bid on a drawing of a spider and won the item bidding $15,000.00. When contacted about his winning bid, Munoz boasted that he never had any intention of paying, and eBay has to say its a binding contract.....but the statement that gets me the most is " "I was just having a laugh about this". Munoz bid on the seven-legged spider drawing created by David Thorne, which Thorne tried to use to pay off an overdue bill. Let's see who has the last laugh on this.....Munoz is a jerk...and this is what eBay sellers deal with regularly. eBay seller's 1963 Pontiac LeMans Tempest Body sells for $226,522. eBay seller 123ecklin knew little about the rusted out shell of the 1963 Pontiac LeMans Tempest he was selling. The owner had died, and left the car for sale. The starting bid started at $500. The ending bid was $226,522. It's interesting viewing the original auction description, and the additional descriptions added throughout the auction- as the seller came to realize he was selling something very rare. One ebay member even gave the history of all six of the Pontiac LeMans Tempests sold. These guys have to be living in a dreamworld. 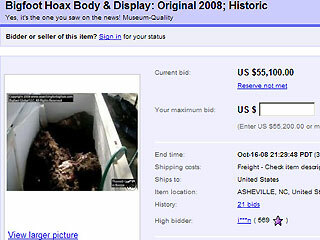 $10,000 as a starting bid (with a reserve) for the costume of Big Foot that hoaxed the world about a month and a half ago....That's what the hoaxers want - according to an eBay auction. The bid as I write this is up to $85K with the reserve not met yet.